Discussion in 'Overclocking & Hardware' started by stenchlord, Jul 15, 2011. And now it's a Mac board. So that's a fully Cherry MX black board with backlit keys, aluminium frame etc for $40 for the board (Aurus + Trade), cleaning ($0), Mac Keycaps ($50 shipped) so $90 all up. Coming from a Logitech G213 Membrane Keyboard which is sarting to have the o and right arrow stick (havoc for scripting) im looking for a decent Mechenical board for a small price. Time is spent between gaming and Work (full time from home) work includes alot of scripting for data migration at the moment. I do have ebay plus and a few days left of my Prime Trail. You specifically want a full size rather than a TKL? I'll keep screaming it until I am blue in the face. full size over tkl, do alot of work in the finance area so its handy to have. Budget is always a killer. Maybe there is one on gumtree or something? 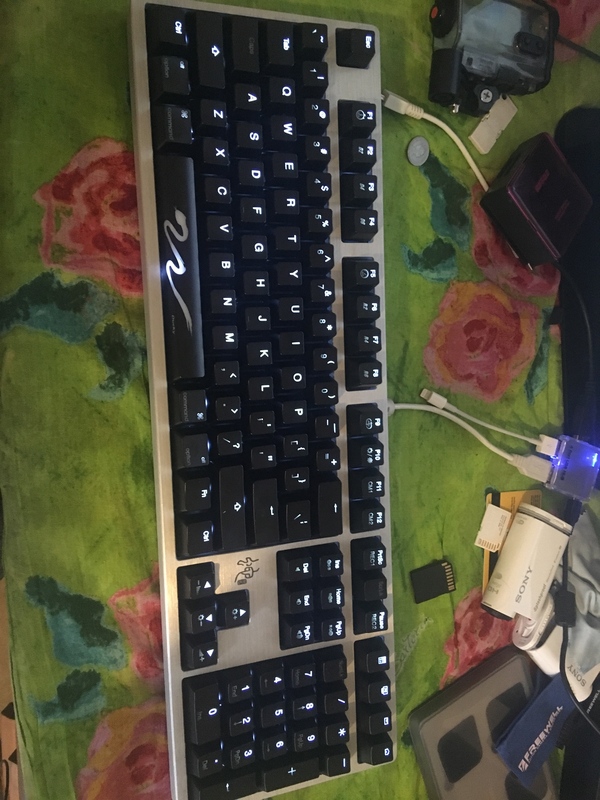 i use a das with brown switches at home and looking to get something for work, are the coolermaster SK630 or 650 units anygood, they look great. anyone used cherry low profile switches? They do look good don't they..
...you’re fully equipped to crush it both at work and in-game. They look nice, just wonder how well they'd wear: "Top print...."
Suppose at that price, who cares? Jazper and self_slaughter like this. Is that the one that umart had for like $30? Well my habit of dragging my k90 by the up arrow has finally come back to haunt me, as I've broken three of the supports for the key. Had to buy a new set from mwave. I still can't believe what is basically the same board I paid barely $100 for years and years ago is now $250 AND it comes with less macro keys. Got the new caps, fit a bit snug but otherwise fine. oh wow, that's a lot cheaper than it used to be... Mine only lasted ~12 months, but at $35, who cares. I''m trying to decide on a new keyboard, my logitech wireless mechanical has become incredibly bad with double/triple pressing keys in just a few months of use. Tempted to get an old ibm and finally get around to retrofitting my computer into the 486 case. Anything that doesn't have useless macro keys everywhere and doesn't rely on windows software would be great. word for the wise - don't use Razer's software with Razer's keyboards unless you desperately need to tweak the settings (even so, tweak then uninstall imo) - too buggy! $72 Delivered thanks to a random 10% off voucher on amazon! Full RGB goodness, the software to control it is fantastic in its simplicity. Came with Key Cap puller and Switch Remover and 4 spare switches! no flex at all in the board too!